The aim of police and judicial cooperation in criminal matters is to ensure a high level of safety for individuals in the EU by preventing and combating crime. 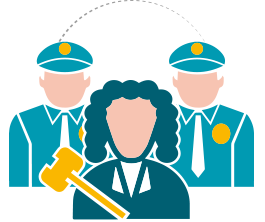 The cooperation takes place between national police forces and national judicial authorities with the help of EU agencies such as Eurojust, Europol and the European Judicial Network where needed. This cooperation involves the collection and exchange of information on people. Speech delivered by Peter Hustinx at the Inter-Parliamentary Committee Meeting, European Parliament, Brussels. On 20 September 2011 the EDPS commented on the proposal for a Regulation on jurisdiction and the recognition and enforcement of judgments in civil and commercial matters. The EDPS highlighted the importance, also in the area of data protection, of facilitating the settlement of cross-border disputes. The EDPS emphasized the need for further reflection on some of the issues raised in the proposal, also in the context of the ongoing review of the data protection framework in the EU. - In particular, the EDPS encouraged further reflection on whether jurisdictional rules should protect the weaker party also in data protection litigation (as is already the case in employment, insurance and consumer protection matters). - With regard to the retention of the exequatur for privacy, defamation, and rights relating to personality, and the possibility to deny recognition of judgments on public policy grounds in these cases, the EDPS noted the need for a strict interpretation of those exceptions, since there is a risk that the public policy ground could be used to deny recognition of judgments, and thus, ultimately discourage cross-border litigation within the EU. - The EDPS further emphasized that it is not clear whether the above exception for privacy rights is intended to cover also violations of legal rules for the processing of personal data as provided for in the Data Protection Directive, and if so, to which extent this may be the case. This may create problems of interpretation and will not contribute to the legal certainty that the proposal aims to establish. - Finally, the EDPS also encouraged further reflection on how to better align the courts' jurisdiction with the competence of data protection authorities. The two sets of jurisdictional rules should be aligned to avoid, whenever possible, that a data protection authority in one Member State, and a court in another Member State would be competent to handle disputes arising out of the same facts.